You did enjoy the Halloween pumpkins, right? We sure did. Here is a quick heads up on what else is happening in the world of Godville. Since the heroes spend most of their time questing it would be useful to upgrade this part of their life. A fresh content update has added a few hundred of new quests (including epics) awaiting to be completed. There are also new types of mini-quests, which are just like the old ones, but better, more varied, and with more exciting rewards – a golden brick, godpower restore, faster quest progress, random aura, etc. Sudden boss encounters while traveling are gone now, but a hero can still meet a boss when on a mini-quest and when that happens he will be smart enough to use a potion if needed. It’s good to remember that a simple godvoice or two can cancel any current quest if a god wishes so. Btw, did you know that quests can have endings? Some of them already have them, but some still don’t. From now on the endings will be visible in the Third Eye, so if you see a quest and you have an idea for a great punch line appropriate for the diary line, you can submit your gem here and get IQ points if it’s accepted. Another change that should come in handy, especially for those of you ever-present, multi-gadget gods – message status sync. E.g. if you read a new friend message on your phone, it won’t show up as unread on your tablet or in a web browser. It’s a bit experimental though and it only applies to the newly received messages (so if the old unread messages are bothering you’d need to logout and login back again if you’re on mobile or reset the page’s setting if playing in a web browser). This feature should already work in a web browser, while mobile apps will require an update (updates for Android and Windows Phone are already available and corresponding iOS update is pending Apple’s review). Bug reports with the detailed description of how it happened are welcome via Ideabox. Oh, and just in case if you didn’t know, Godville iOS app has been recently updated with a whole bunch of goodies: brand new Today Screen widget, Phone 6/6+ support and Touch ID login. Make to sure to stay up to date to get enjoy the awesomeness. Let’s add some finishing touches on the renewed arena. Firstly, the duel ties are no more. Instead of tossing the coin, arena judges will throw in potions or do whatever they can to see who would actually win, fair and square. There are two new special duel conditions too. First one limits the maximum number of influences to two (instead of the usual four). Second one is for the beloved gods with temple – your hero now has a chance to get a log of gopher wood for winning in the arena. Meanwhile, a new report from free-walking spelunkers mentions new kinds of dungeons with new side quests. Let’s dig! In other changes. Due to the limitation of having constructive discussions in the Ideabox, the “Questionable Content” section is now closed. Instead, please use this forum topic to submit and discuss “not good enough” or confusing texts from the game. (Bugfixes, grammar corrections and inappropriate content should still be reported via Ideabox/Corrections). Finally, as it was announced in the previous post a new town is about to be founded. “Roflopolis” will be its name and now it’s up to you to decide where this town would be. Any suggestions? It’s been some time since new Arena was opened and now the time has come to lift the drapes from the new pantheon – the Pantheon of Duelers. Its rating is based on the classic Elo rating system, which accounts for the outcomes of all previous duels of both players. It’s also more forgiving towards occasional loses (comparing to the old rating). To make things even more interesting, there now will be contest seasons. During a given season all wins and losses will be counted towards the present player’s rating. Once the season is over a new achievement will be awarded according to the final standings and the rating will start over again for the next season. The guild dueling pantheon (previously known as the Pantheon of Aggressiveness) has been renovated as well. Now it’s called the Pantheon of Duelery and it’s also based on the Elo ratings of the most successful duelers among the guild. This rating is not seasonal and it accounts for all fights that took place since new arena rules were put in place (June 6, 2014). In other news – the influx of new dwellers are about to settle down in some remote locations, but they yet to name their towns and decide what to do. So, if you have great ideas for a particular new feature for town (as well as a name) please voice it via comments or Ideabox. Let’s join our divine hands in Godville-wide congratulation of Kingdada for completing the First Ark! It’s time to reveal its perks. Firstly, an owner gets a shiny new medal. Secondly, heroes can now use the ark in accordance with its widely known application – store multiple pets. Following a god’s command a hero can place his current pet in the ark and head on for taming a new one. Thirdly, an ark-owning god is finally powerful enough to give a name to any pet of his hero. Other uses for arks are also likely when there will be quite a lot more of them. Btw, arked heroes will keep scavenging for gopher wood – who knows, it may come in handy for upgrades. Speaking of pets, a bunch of new monsters have became tameable. Some of them even have an all new dungeon-ability and are fully capable of accompanying their masters in spelunking. For now these breeds are Grounded Hog, Inner Demon, Gummy Wyrm, and Vengeful Mole (feel free to suggest more in comments). Also, a report from the mad scientists claims that a fast healing of the pet (within 10 hours after the knock out) will boost up its development – the pet will gain a new level faster or even level up right on the spot. Btw, did you know that heroes with a pet medal change their pet’s personality three times more often? The most groundbreaking update comes to dungeons. Recent developments unearthed half a dozen new types of dungeons, a new kind of harmless trap (that forces the team to skip a turn) and a mindbreaking “Hot and Cold” treasure clues. But here’s the real kicker – dungeon side quests! Sometimes heroes can get a minor side job like visit a certain room or avoid all bosses. These side quests are entirely optional (except for that one case when it’s not), but most of the time the reward should be totally worth it. Happy spelunking! Well, it took some time, but it’s finally here – new Godville app redesigned for iOS7. The app was “flattened out” to make it look better on the latest mobile OS from Apple and it has some new cool things too. On iPhones is has two secondary screens that can be revealed with handy swipe gestures: swipe left to reveal Friends/Guild Council and swipe right to bring up the Game’s Menu. Remote Control moved closer to the Diary, but here is the cool thing – most of the time you can avoid opening it, as now there is a brand new Mini-Remote! Press and hold the Remote button and then drag to send an influence of your choice. That’s how you show your divine reaction while still reading a diary. much easier voting – dupe/offensive options were moved under the long press gesture (or swipe left when on Windows Phone). voting progress is now displayed on your personal ingenious pieces page while idea is still being voted. 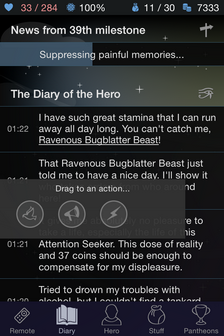 Finally, a fresh batch of awesome phrases has arrived into the heroes’ diaries. In the mean time, the Spring Content Cleaning is underway. If you have that one phrase that you wish weren’t in the game, it’s a good moment to mention them in this forum topic. New species has been discovered in the living world of Godville. Do you remember holiday monsters walking around with free accumulator charges? It turned out that they were only a first wave and there are other special beasts too: Wealthy (walk around with pockets full of gold coins), Bricked (like to carry bricks, sometimes even gold ones), Enlightened (restore some godpower when defeated), Glowing (can infect hero with an aura) and even more. Winning over the special monster usually gives some perks, meanwhile losing to it sometimes results in an equally unique penalty. So pay attention to the adjectives in the monsters’ names and don’t miss your lucky beast. Dungeon of Uncertainty – all hints to the treasury are double-minded. Dungeon of High Stakes – winners take extra gold from the treasury while knocked out get nothing. Aura of Hunting – increases chances to dig up a boss or just stumble upon a boss while traveling. Aura of Baiting – helps find the newly discovered “special monsters” and the monsters wanted by the Godville Times. Finally, an announcement from our players: Are you smiting for smooches? Hurting for hugs? Is your idea of a good Valentine’s Day telling your hero to beat someone up? Sign up to Tournament of Champions: Valentine’s Day Massacre! Sign ups are open until Midnight, CST February 10, 2014. It’s that time of the year when the feeling of coolness is accompanied with the joy of unpacking presents. As usual, the hordes of Santa Clawses and alike swarm into Godville for whatever reason. They carry so many presents, so they literally just litter them around, making heroes happier and wealthier. Important note: for the first and only time during the holidays these special monsters can be tamed! This year nature also rewarded us with a new invention – a special breed of holiday monsters that gift an accumulator charge once defeated. Pay attention to whom your hero is fighting and don’t miss your chance. Finally, for this very special occasion, a pop-up settlement of fair tents was opened right next to the capital. Laplandville welcomes all visitors with bargain sales, generous traders, and extra-effective chapels. Greetings, Godville gods! Are you ready for some good news? Let’s start with spelunking. To make tedious underground explorations more exсiting heroes can now end up in special named dungeons, ones that have certain aura-like effects. This effect can do something nice, not very nice or just strange and fun. Pay attention to the introduction phrase at the beginning of expedition to know what the effect does. In the effort of streamlining the Remote Control, the “Send to Arena” action now requires only 50% of godpower, just like the other options in close proximity. In the meantime, not finding a duel opponent still guarantees a consolation prize. One more note about the “Challenge a Friend” option: from now on, winners of imaginary sparring fights will be rewarded with 1% of real experience (only once in 24 hours), which is infinitely better than it was before. The long overdue update of the earthly news finally brought us more than five hundred of new entries. Yay! Lightning (or any other punishment) are now more likely to melt gold coins into a brick. After all, high temperatures are obviously better for this than sweet encourages or sending flowers. Godville Windows Phone app has been updated with support of new color themes, making it as fancy as Godville apps on other mobile platforms. Make sure to install the update and enjoy all colors of the rainbow!